I cannot believe it's already the third week of July. I feel like summer has only just begun and yet it's almost over. Summer really is my favourite season. I love it for the weather, of course (when it's cooperating), bare feet, strappy tank tops, capri pants, BBQing, icy drinks dripping with condensation from the heat, taking the dog for walks by the river and watching him freak out when he forgets he can actually swim, driving with all the windows down...oh the list goes on. Summer is also a great time for reading. I love sitting on the deck, basking in the sun as I catch up on the piles of books and magazines I've collected over the year. 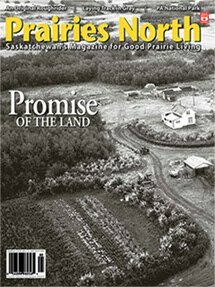 In particular, I invite you to pick up the summer issue of Prairies North magazine, where you'll find my 'On the Trail' story. In it, I chronicle my trail riding experience through Saskatchewan's Prince Albert National Park with cowboy/rancher/tour guide Gord Vaadeland. It was my first time spending any real time in the neighbouring province of Sasky and I was pleasantly surprised by how much I liked it and how different it was from what I expected. Everyone thinks of flat plains and grasslands, but SK is actually full of boreal forest and bogs! Yes, bogs! Anyhow, hope you're all enjoying the sunshine! Here's to summer!